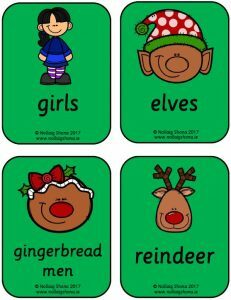 This fun literacy-based seasonal resource is aimed at pupils in middle standards. Pupils are given an alphabet code where each letter of the alphabet is represented by a random number 1-26. Pupils are then given seasonal sentences with a word missing – the missing word is written in the number code. The pupil then has to work out the code to find the missing word. The sentence can then be written out in the pupil’s copy. This resource is aimed at pupils in middle classes. 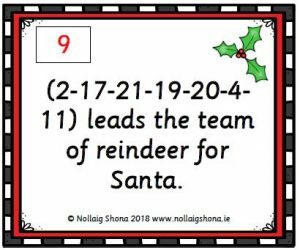 There are statements about Christmas on flashcards and pupils have to sort out the statements and decide whether they are true or false. There are twenty sentences to sort, ten of which are true and ten which are false. The resource assumes an ability to read. This resource is aimed at junior/middle pupils or SEN pupils at the beginning of work on literacy. 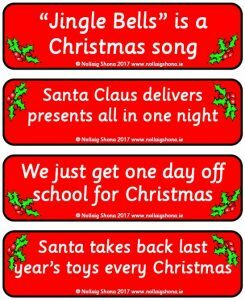 It focuses on Christmas-themed sentence construction in a fun way. 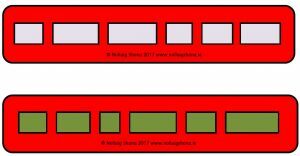 There are eight pages in the resource which should be laminated and cut up into 32 separate cards. 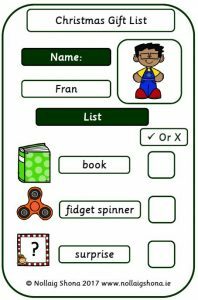 This resource is aimed at pupils in first to third classes or SEN pupils. Its purpose is to assist with the understanding of both sentence structure and reading for meaning. These Nativity-themed sentences are made up of six words. Laminate all of the pages in the resource. 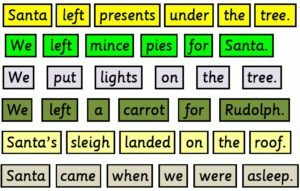 Cut out the six sentence strips and the corresponding words, which are colour co-ordinated to assist with matching. Place velcro in each of the empty boxes on the sentence strips and on the rear of the individual words. This resource is aimed at pupils in first to third classes or SEN pupils. Its purpose is to assist with the understanding of both sentence structure and reading for meaning. 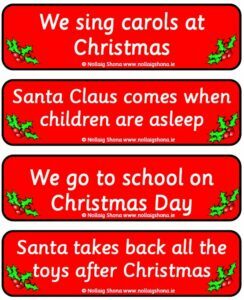 These Christmas sentences are made up of six words. This resource is aimed at pupils in middle classes. 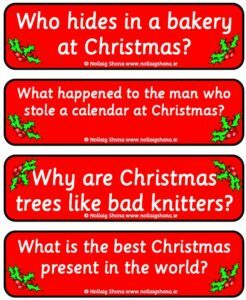 There are Christmas Jokes questions on red flashcards and Christmas Jokes answers on green flashcards. Pupils have to sort out the jokes and match the questions to the correct answers. There are twelve jokes to match. The resource assumes an ability to read. Print out all pages in the resource and, if possible, laminate all of the pages. Cut out all of the flashcards. Print out all pages in the resource, including the “True” and “False” signs at the end. If possible, laminate all of the pages. Cut out the true and false headers as well as the twenty sentences.